Het Koninkrijk België is een West-Europees land begrensd door de Noordzee in het westen, Nederland in het noorden en noordoosten, Duitsland in het oosten, Luxemburg in het zuidoosten en Frankrijk in het zuiden. Le Royaume de Belgique est un pays de l'Europe de l'Ouest ayant une frontière commune avec les Pays-Bas, l'Allemagne, la France et le Luxembourg. Il est bordé au nord-ouest par la mer du Nord. Il s'étire sur une distance de 318 kilomètres entre Ostende et Arlon. Das Königreich Belgien ist eine föderal organisierte parlamentarische Monarchie in Westeuropa. Es grenzt an die Niederlande, Deutschland, Luxemburg, Frankreich und an die Nordsee. 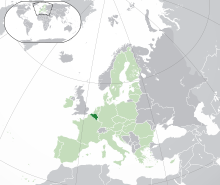 The Kingdom of Belgium is a country in northwest Europe bordered by the ► Netherlands, ► Germany, ► Luxembourg and ► France and is one of the founding and core members of the European Union. Belgium is divided into three federal autonomous regions: ► Flanders, ► Wallonia and ► Brussels. More images Belgium - Belgium (Category). This section holds a short summary of the history of the area of present-day Belgium, illustrated with maps, including historical maps of former countries and empires that included present-day Belgium. Between 57 and 51 BC the Belgae are defeated by the Roman Empire. The area becomes the Roman province of Belgica and is romanized. This map shows the Roman Empire in 50. De territoriale ontwikkeling van de Romeinse Republiek en het Romeinse Rijk. Around 256 the Germanic tribe of the Franks enter Belgica and since 296 they rule the area as defender of the border of the Roman Empire. This map shows the invasions of the Roman Empire 100-500. [[|border|251x400px]] After the division of the Frankish Empire in the Treaty of Verdun the area became part of the Middle Frankish Empire. This treaty leads to the most parts of the area becoming part of the East Frankish Empire. [[|border|251x400px]] This map shows the Holy Roman Empire in the 10th century. The house of Bavaria-Straubing comes in 1346 in the possession of Hainaut, which is in a personal union with the County of Holland. This map shows the Low Countries in 1477, largely under control of the Burgundians. The Burgundian possessions come under control of the Habsburgians since 1506. This map shows the Low Countries as part of the Holy Roman Empire. And this map shows the Low Countries as part of Habsburgian ruled Europe, as does the following map. It was the empire of Charles I/V. In 1568 a rebellion against the Spanish occupation starts. This map shows the area ruled by the Spanish king around 1580 (Netherlands in blue) on a map showing modern-day state borders. The northern part of the ► Netherlands develop as the Republic of the United Netherlands into a de facto independent state. The southern parts remain at the same time under Spanish rule as the Spanish Netherlands. This map shows the Netherlands from 1559-1608. This map shows both the United and the Spanish Netherlands. The Spanish Netherlands are at the same time part of the Holy Roman Empire, as are formally the United Netherlands to. In 1713 the Spanish Netherlands are acquired by ► Austria: the area gets known as the Austrian Netherlands. After a revolution in 1789 the United Belgian States are founded, but already in 1790 Austrian rule is restored. In 1794 France invades the Austrian Netherlands and incorporates them together with Liege into France. De Zuidelijke Nederlanden als deel van het Franse Rijk in 1811. After the French defeat in 1815, the Austrian Netherlands are united with the Netherlands and Liege into the United Kingdom of the Netherlands. This is a constitutional monarchy with real power in hands of the King. ► Moresnet becomes a condominium with ► Prussia. A revolution in the Southern Netherlands leads to various partition plans. This map shows the Talleyrand partition plan. Le territoire belge entre 1830 et 1839. At the end of the nineteenth century, Belgium controls a colonial empire, especially Belgian Congo. In 1940 Belgium is invaded and occupied by Germany. Hubert Pierlot (Prime Minister of Belgium) and his government go into exile in London. Belgium is liberated in 1944. See the Atlas of World War II. 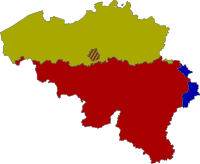 An important constitutional reform occurrs in the summer of 1993, changing Belgium definitively from a unitary to a federal state. This makes Belgium is a federation of Dutch-speaking Flanders, francophone Wallonia and bilingual Brussels. The Netherlands form in 1816 together with Prussia the condominium of Moresnet. The Netherlands position is continued by Belgium after its independence. The condominium exists until the end of World War I.
Das preußisch-niederländische, später preußisch-belgische Kondominium Neutral-Moresnet. ↑ Interrupted by German occupations 1914-1918 and 1940-1945. Deze pagina is voor het laatst bewerkt op 28 dec 2018 om 17:22.